The mulberry tree - more like a green "afro" than a "hat" perhaps! Yesterday I was looking at an old house at Casa di Tasso, just outside Amandola. 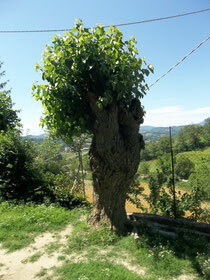 In the garden was a gnarled, old tree which wore a "hat" of green leaves. I asked the owner about it. He told me that it was a mulberry tree and that it was the last of many that had been on the land. The trees were all male as the farmers didn't want any fruit. The leaves were used to feed silkworms which may have got a disease if they ate leaves stained with the fruit and/or the juice. Until the Americans started selling nylon stockings in the early 1940s, the area had produced silk which was sold for silk stockings.